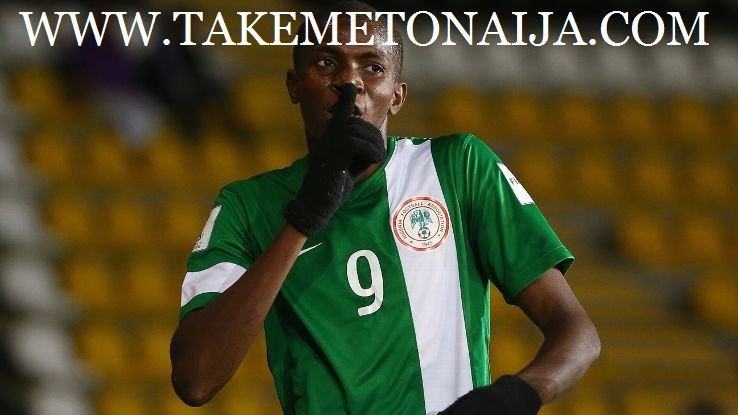 Victor Osimhen is a Nigerian football player who plays center forward, he came into limelight in 2015 after performing well at the 2015 Under 17 Fifa world cup, He broke a longtime record after scoring 10 goals in the tournament making him the tournament’s top scorer of all time. He was later bought by a top premier league club SPURS a week after the tournament ended. Just like many kids, Osimhen started football at a very tender age and it was not long before his coaches noticed something special about him. Coach Paul Irikhewe was the first man to introduce him to organised football and he said he was not surprised to see the player turning into an international star. “I saw the potential in him right from time and that is why I usually encourage him and I think due to hard work, discipline and dedication he is excelling today, I am happy. “I started working with him right from kindergarten, just like most of the boys you see here (pointing at players who were at a training session). They all grew up together and we have been working with them since then. He was not a difficult person to work with and that is why I am not surprised he is doing well; he is very respectful, humble and hardworking. “He played a lot of youth competitions here with us but after sometime I moved him to play in Onigbongbo Junior League in order to face bigger challenges. Pa Osimhen (His dad) now walks tall among his peers today because of his son’s exploit. But according to Andrew (His brother), their father was unaware of his son’s talent before he became an international star. In Andrew’s words: “Honestly speaking my dad is shocked about what Victor is doing, he did not even know the import of what is happening until people started knocking at his door saying ‘was that not your son we saw on TV now?’ Dad had never seen Victor play before; he doesn’t even own a generator to watch him in the ongoing U-17 World Cup in Chile. Although they see football as profitable, many African parents still believe education provides the surest getaway from poverty. So, Osimen’ parents wanted their child to go in search of a sound education. “Initially I opposed the idea of him facing football squarely, I wanted him to take his education seriously because since I could not go to higher institution, I wanted my younger ones to especially our last born,” Andrew added. Many of his friends testified to the fact that Osimhen is a gentle, reserved and almost an introvert, but some of them following close encounters have found out over the years that the striker usually loses his cool on the football pitch. “He is a fighter when playing football so we are not surprised to see him like that in the Nigerian team,” Orji said. “Whenever we are playing kick-about football in the community, you could incur his wrath if as a teammate you didn’t play well. He wants to win every game, he can shout at you, abuse you if you stop him from winning.” “He is a tough opponent as well as sometimes a difficult teammate. He wants you to give as much as he is giving to the team and if you fall short of that, he can pick up quarrel, that is the time you will see him in bad mood,” Dada Jimoh, another close friend added. Sports gene in the family Apart from being a footballer himself, Andrew confirmed that the sports gene runs in the family. Their father, Pa Oshimhen, was a popular local wrestler in the village, he also said their late mother was a sprinter and was also popular in her time in the village. Saturday Telegraph learnt that the landlord showed little or no understanding when the family was unable to pay rents regularly. “I am happy about what is happening to them through Victor because they really struggled,” a neighbour who did not want to be named said. As the Saturday Telegraph reporter was about to leave the environment, one of the neighbours pointed at a bread seller. And the bread seller woman said: “This is where Victor used to buy bread, he likes bread so much,” he said. We approached the bread seller and asked if truly she knew the player and his exploits at the U-17 World Cup. “He is my customer,” she answered. “He used to buy bread from me almost every day. Many football stars in Africa never led lives of affluence before reaching stardom and little Osimhen was no different. He is from an impoverished background just like many kids in Africa; he was introduced to struggles in the streets even before he could correctly pronounce his name. According to the first born of the family, Andrew, the hardship they faced was so biting that little Victor, then a toddler, was made to face scorching sun in Lagos traffic where the mother used to sell sachet water to augment her paltry income as a civil servant. “My mum sold sachet water here after coming back from work, so also my sisters,” Andrew who is a newspaper vendor at Ojota told our correspondent. “Victor was very young and mum usually strapped him on her back running after vehicles to sell sachet water. Indeed, growing up was tough. “It became so tough and embarrassing when one of my sisters gained admission into secondary school and there was no money. Many times we didn’t have money to pay our rent, things were so tough. The little salary mum was earning usually finished within a week and the struggle would start all over Amidst that misery, life dealt another big blow on the family. Their enterprising mother lost her life about seven years ago. “It was a tough time for us, but life had to go on. It is unfortunate that mother is not here today to see what her son is doing,” Andrew said. “I really hustled on the streets of Lagos and toyed with the idea of doing so many things initially,” Osimhen, the last child in a family with six other children, told Cafonline.com. “I sold things like sachet water in the traffic but I knew the only thing I wanted to do was playing football though I have other talents. Osimhen has no godfather, no one gave him a note to Golden Eaglets coach, Emmanuel Amuneke, but the striker only needed 10 minutes to win the heart of his coach during a trial. According to Olorunfemi, they got information about the open screening going on in Lagos and they went there to try their luck. “We went there the first time but due to a large turnout it did not get to our turn. I could not go the second time because I was not feeling well, but Victor went. Luckily, he made it. He told me how coach Amuneke was dismissing strikers that were tested before him in just one minute and before he could get to his turn he was thinking aloud as to what the coach was looking for in those strikers that they could not give him. He noticed those ones were not marking very well and he went there to do just what he thought the coach wanted. He collected a ball from a defender in just few minutes on the pitch and scored from that, after just 10 minutes the coach asked him to go and sit down and since then he has been part of the team,” he said. When Osimhen scored his first goal of the tournament in the 2-0 win over USA, he went straight to the coach and prostrated. He said after the match that: “I prostrated before coach Amuneke after the goal against USA to show appreciation for all what I have learned from him,” he stated. With ten goals at the 2015 FIFA Under-17 World Cup underway in Chile, Victor Osimhen broke a long time record of 9goals is the tournament, the bean-pole Nigerian striker now sits at the top of the highest scoring chart in the world under17 tournament, justifying claims that he is indeed one for the future. To say that fate has a hand in the budding career of Osimhen is perhaps stating the obvious. He came from a humble family and had to hawk in the ever busy Lagos traffic along with his siblings in order to augment the purse of the family. However, he was determined not to let go his first love. “Though I was born with the talent, I also learned playing football by watching my elder brother,” the forward who stands 1:85m revealed. “He (my brother) used to play as a striker for the senior team of a neighborhood club. I joined the club later and I aspired to be better than him. Since he broke into the Nigeria U-17 team, when he scored a brace in a friendly in June 2014, Osimhen has been the soul and heart of the team scoring goals with prolific efficiency. At the last count, he has remarkably scored a total of 45 goals, in all matches for the coach Emmanuel Amuneke-tutored side. “Victor is the kind of player any coach would be proud to have in his team because he is always ready to give his best for the common good of the team,” noted Amuneke, the 1994 CAF African Footballer of the Year. The admiration between coach and player was there for all to see at the Estadio Nacional in Santiago on October 17 when Victor struck the second goal in the 2-0 defeat of USA, going on all four before his mentor. Apart from the strike against USA, Osimhen netted brace in the 5-1 crushing of hosts Chile, and the only goal in the 2-1 loss to Croatia. Against Australia at the Round of 16, the teenage forward roared loudest netting a hat-trick as the Golden Eaglets eased past the Aussies 6-0. Prior to coming to Chile, he emerged amongst the top scorers at the continental championships in Niger last February, with four goals in six matches. His biggest guide rest on the words of former England captain ‘football’s not just about scoring goals – it’s about winning’. “Playing for the Golden Eaglets has boosted my confidence but I don’t see myself special amongst my teammates. I dreamt about playing for the national team and gradually, I have settled down into the U-17 team. “I really thank God for helping me to be part of this team. In school, I played in some competitions but there is nothing like playing for the national team. “Success of the team comes first and it is always my aspiration to always score goals for the team when I’m given the opportunity to play,” noted Osimhen who has a fond admiration for former African Footballer of the Year and Ivorian legend, Didier Drogba. Osimhen too can score goals in the company of anybody; and his goals for the Golden Eaglets has come in different shades, but reckons his second goal for Nigeria in a 3-1 defeat of Zambia at the 2015 African U U-17 Cup of Nations in Niger as the pick of the pack. After they won the 2015 Under 17 Fifa world cup, it was revealed many huge clubs from England have been chasing him, clubs which includes; Arsenal, Man. city, Spurs and others.